I was hoping to write my review of Cloverfield here today, but Nicole Lou had to stay home and look after a sick wife, in addition to not feeling well herself. Given the business of my do-nothing schedule lately as recounted in earlier postings, I was sort of looking forward to an excuse to do nothing. Rather than go see the movie by myself, which I'm prone to do (Jessica has no interest in monster movies, especially those that attack Manhattan), so I stayed home. I caught up on magazines (I get a lot of magazines these days) and I got caught up on TiVo. ...and most of the February 5, 2008 California Voter Guide. Apparently, some tribes want more slot machines. I made dinner later (Jessica is working at BR until midnight). 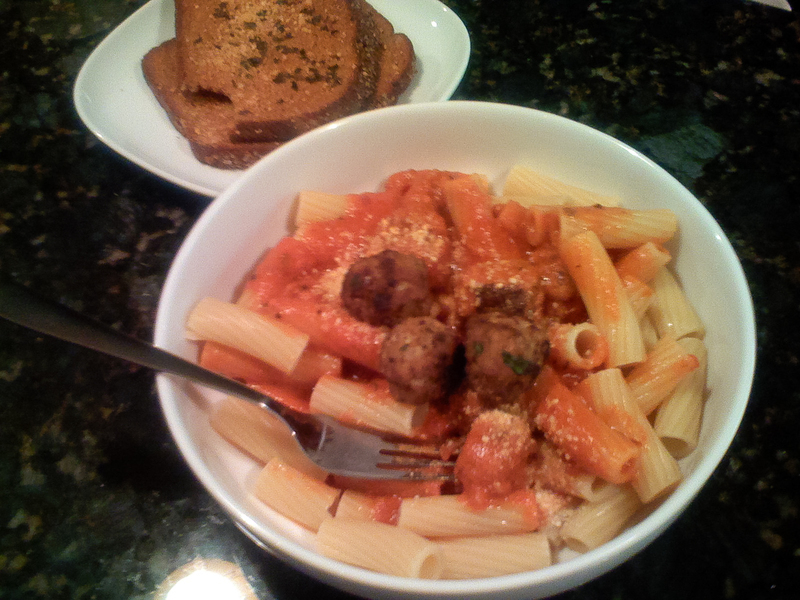 I made rigatoni with meatballs and spicy cream tomato sauce (pictured). The dog helped by watching closely. It was quite delicious.